the art resort offers a unique approach to connect groundbreaking contemporary art with inspiring spaces, architecture and excellent design. A new generation of creatives has changed the definition of what we label as "fine art" and transformed the landscape of hotels and resorts into a new realm that emphasizes the experience. By inviting influential artists from all fields of new media and art to outstanding resorts and venues we honor their impact on art, design and architecture while offering a fresh view on both, the art and it´s surrounding. Beside our special editions featuring one artist at a time we will serve you assorted tidbits from all flavors on a daily base. A khlong to relaxation. A place “far from worries”. 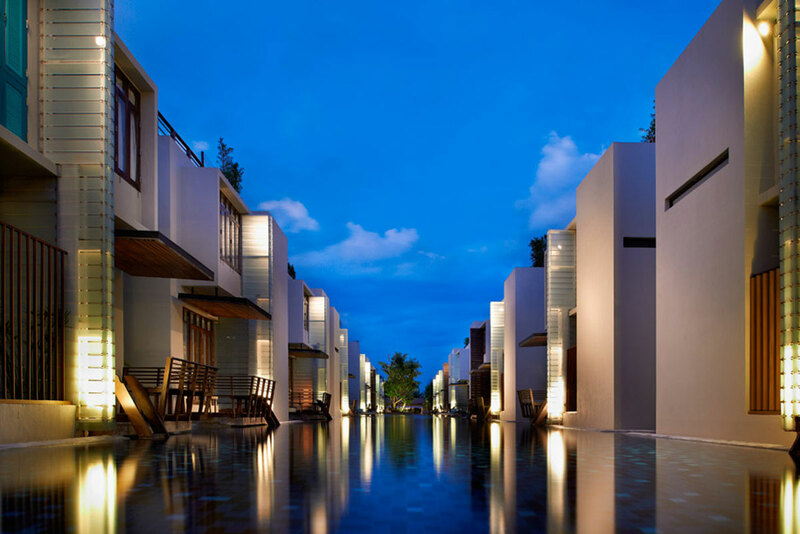 The impressive 120meter pool of the Lets Sea Hua Hin Al Fresco Resort at the beach of Hua Hin, Thailand. One of the best rated lodgings in the area. From the Industrial Revolution to the Art Revolution...torpedos to paintbrushes. One of my earliest and fondest memories is of being welcomed into where the magic begins. I was in the 4th grade, when a great art teacher, Mr. Lipiano, took us on a field trip to the "Torpedo Factory" located in Old Towne Alexandria, Virginia. I was introduced to professional artists who made a living on their creativity. Painting studios, sculptures, photography (film) were showered by the wonderful lighting, wide open space, and backdrop of the Potomac River and the Nation's Capitol. The entire scene of a zen like focus and inspiration, not tainted by pretention, served as an educational experience that inspired me to seek out adventures to RISD, and continues to serve as an aspiration for my own OASIS someday. It's funny how some memories forever make an impression. Pioneer Works brings together the arts and sciences. And soon, restaurants and tourists will flock to Red Hook, Brooklyn proving yet again, that art brings life. Ever since I learned to float, I have been swimming with my oldest dream. Now the waters of fantasy have receded, and Pioneer Works has surfaced, a hall of brick and light. Our utopia is the architecture of impromptu synthesis. The floor is an exhibition space; the walls are working studios; the windows are openings onto the infinite psychogeography of New York City. The gulf between different modes of thinking yawns ever wider. Gone are the swinging salons, the café manifestos, the petitions wet from inkwells. Tangible cooperation is eroding—we need people to be talking and touching, not just typing. Pioneer Works fearlessly bridges the chasm between disparate disciplines. A biologist excitingly beckons a musician to the microscope, a painter shares her sketches with a geneticist and together they discover a new algorithm for printmaking. It is a nursery for innovation, an alpine highway to the horizon of the imagination. It was once said “Art is a lie to reveal the truth.” For me, art is never a lie, but always a truth in itself. Art is a revelation that what could be is just as real as what is. All are welcome to join in this apotheosis of human endeavor. From Naoshima, the view of the Inland Sea is truly tranquil and picturesque. Over the span of more than 20 years, we have been cultivating an oasis on and around Naoshima, far from the bustle of cities flooded with information, burdened by stress, and distracted by excessive entertainment. Our vision has been to create a physically and mentally rejuvenating haven where you may find yourself musing on the true meaning of "living well" (which is what the word Benesse was coined to mean), and at the same time, a place where art is not experienced by studying set attitudes but appreciated on your own terms, as another opportunity to ponder living well. Benesse Art Site Naoshima combines Benesse House (a symphony of nature, art, and architecture), the Art House Project (which weaves threads of everyday home life with the substantial strands of history), and Chichu Art Museum, a fresh reinterpretation of the potential of art museums. Our work now encompasses projects on nearby islands. Inujima is not just a government-designated site commemorating Japan's industrial heritage; it is also the venue of the eco-themed Inujima Seirensho Art Museum (refinery) and the Inujima "Art House Project". On neighboring Teshima, a project on the theme of "nourishment" is underway. Although the message these islands of the Inland Sea transmit to Japan and the world beyond is powerful, they maintain a quietly assertive presence as sites of creation where the rhythms of local nature, history, and art are in tune. We invite you to visit our oasis and remember what it means to live well. Instituto Cultural INHOTIM is located in Brumadinho County, MG, and 60 km away from the capital city of Belo Horizonte. The museum is built inside the Inhotim Environmental Park reservation. Its architecture is very beautiful and its assets include over 500 contemporary works of art by over 100 artists, besides temporary photographic and cultural displays. The natural area of the complex is divided into two parts: the Natural Reservation, with 600 hectares of land and the Tropical Park, with 45 hectares of gardens with botanical collections and five ornamental lakes adding up to an area of 3.5 hectares. The gardens were designed by landscape artist Roberto Burle Marx, who visited the site in 1984 and made suggestions and drew blueprints to improve the institute's environment. About 110 thousand people from Brazil and from the world have already visited INHOTIM in the last 12 months. The Cultural Center has become a cultural reference for all those who wish to appreciate contemporary art innovatively. Inhotim also carries out cultural programs that include environment, education and technology weeks. The site offers something for everyone: art lovers who can gaze at the beautiful works of art on display; nature lovers who enjoy native woods conservation and the elaborate gardens that surround the building; and those who admire architecture will not be let down by the innovative design of the buildings. Original pavilions, constantly renewed exhibitions, diversified assets and a preserved environment make Inhotim a must visit for tourists who visit Belo Horizonte and its surroundings. INHOTIM is also committed to preserving and studying the environment. It uses an area encompassing 12.00 hectares surrounding the gardens to carry out the vegetation preservation and recovery programs, as well as environmental education programs for the young people from the community it belongs to. Ready for an appe-teaser? Here is a sneak peak of a new menu item. Chef Sean explains the importance of farm to table for the #Harrimans summer menu media event.